A day after Private Booth was killed Private Cyril Arthur Turton suffered the same fate. He was born in Beeston on 25th July 1895. He was the son of Mr Benjamin Michael who was born in Beeston in 1867 & Mrs. Caroline Turton, of 33, Middle Street, Beeston2. Benjamin Michael Turton married Caroline Brooks in 1892. Cyril Arthur was one of the original members of the 17th (Nottingham) Beeston Company Boys Brigade. While serving in the Boys Brigade he excelled at sport, representing both the club and the Battalion Football teams, and was Captain of the 17th when they took part in the Swain Shield Finals of both 1910-1914. He was also the first member of the Lads Club to achieve the highest award the "King's Badge". Private Turton’s army record is identical to Private Booth’s marching to enlist in Nottingham with his Boys Brigade Leader and his Pals. 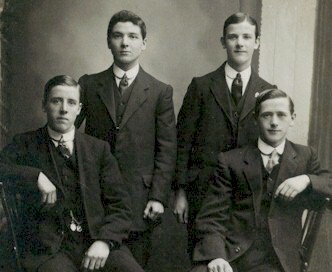 In the poignant photograph, below right, taken in 1913 of four "Old Boys", Cyril Turton is standing on the left; standing on the right is Fred Giles who survived the war, but was at the side of a friend, another Beeston Old Boy, Private Percy Pilmore when he was killed on March 9th 1916. Seated left is Samuel Burdett who was killed in action on Sunday 2nd of July 1916, during the Battle of the Somme. Seated right is George Brackner who died of a fever while in a hospital in Gallipoli, on 25th October 1915. 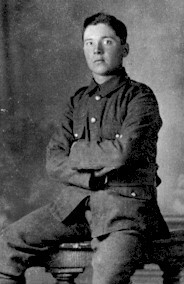 After enlisting in the "Notts & Derby's" he joined the 1st Battalion eight days before Wilfred Booth and served with "D" Company. It was with regret that news was received in Beeston of the death of Private Cyril Arthur Turton He was reported missing, believed killed in action, on Friday 12th March during the second day of the "Battle of Neuve Chapelle", and, although at the time there was just a hope he may have survived, the sad news was received that he must have died. It was reported in the Red Cross Enquiry list dated 26th July 1915 as being slightly wounded on 12th March. This ties up with a letter sent by another pal serving with the 1st Battalion Private Charles Dean to Cyril Turtons mother.He wrote to to say that Cyril had been slightly wounded, the enemy having shelled the billets the day before the battle, killing one man and wounding nine others including Cyril Turton. He seems however to have taken part on the 11th March 1915 as Private Whittingham of Mona Street Beeston informed me that he was by Turton’s side when the attack commenced. Mr Burnham has conveyed to me your sad message and I need not tell you that you have our deepest sympathy in your loss. And not only your loss but ours. The fact that he went up step by step to the highest rank the Boys Brigade has to offer shows that we valued his services, and only his daily work prevented him the last year or two from giving us more time. With his two pals George Brackner and Samuel Burdett he was always punctual in his duties and ready to help whenever it was wanted. Their friendship was an outstanding feature of club life, and we regret that they have not been allowed to renew it, but such matters are not in our hands, and we must patiently abide His will who rules over our destiny's. Cyril's memory will always be held in respect by all those who came in contact with him, and nobody more than Officers of our Lads Club. What this letter could not envisage at the time was that Cyril's two pals George Brackner and Samuel Burdett would not survive the war. Both Private Turton body was never found. 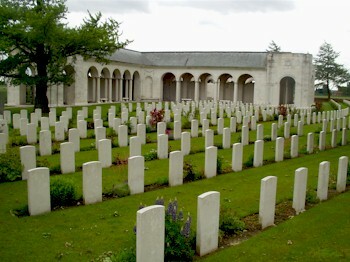 Having no known grave, his name, and that of his pal Wilfred Booth, are inscribed on the panels of the "Memorial to the Missing" in the Le Touret Military Cemetery. 2The address given in the records of the Commonwealth War Graves Commission. At the time of the 1901 Census, the family was living at 30 Denison Street, Beeston, (Piece 3153 Folio 29). Benjamin Turton was working as a lace maker and was recorded as born in Beeston in about 1871; his wife Caroline (née Brooks) was shown as born in 1871, in Sutton in Ashfield, Notts.